I know that the festive season is now over and that few will be thinking about drinking champagnes or other sparkling wines, but, if one has the chance and/or the financial means, it is almost always a good time to be drinking Champagne. And especially if it is a very good one. Because Champagne is just like any wine in that quality always shows, despite, one might say, the bubbles which tend too often to act as a generic smoke-screen. If you can drink and enjoy the wine from a bottle of Champagne without the exhilarating effect provided by the bubbles (try letting the gas in a part-finished bottle evaporate overnight then cool the remainder and taste it), then that is a good wine. In other words, when picking a Champagne, always look for the wine behind the bubbles. The wines made by Vincent Laval bear his father’s name, George Laval. This is often the case in Champagne. I did not know the wines of this very small-scale producer (just over 2 hectares of vines) until recently, when the wine above came out as my preferred Champagne in an extensive blind tasting (the bottles were all masked) that included 91 others, many of which were extremely famous. This wine is expensive, and in fact was the most costly of the series, as so many hand-crafted, meticulously produced products can be. The price is not absurd, but it is high at close to 50 euros a bottle (in Europe). And this is just his « entry-point » wine, as Laval makes several other cuvées from single plots of vines, all with the same care, and all incredibly good. These are even more pricy. 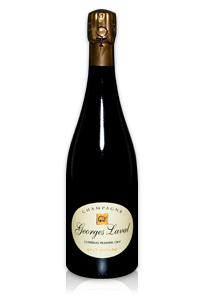 George Laval’s Champagnes will be quite hard to find, as the production is tiny. So you could accuse me of being elitist here, which is not my wont. In my defense, I can only say that I did not know the price of this wine when I first tasted it, simply finding it excellent. I have tasted it again since then, alongside all his range, finding all of them quite superb, even if I cannot afford them. The designation « Cumières » refers to the village where Laval has most of his vineyard holding. This village lies more or less opposite the town of Epernay, on the right bank of the Marne river, and has 1er Cru status. For those of you who live in France, or nearby, you could try this excellent address which usually has some of George Laval’s wines, as well as a lot of other excellent Champagnes from small producers. The flavors are quite rich and intense for a Champagne, yet not aggressive in any way. The bubbles seem gentle and peel away to reveal layers of slightly burnished flavors that unfold on the palate, hard to describe but luscious and stimulating. When I first tasted it it reminded me of the style of Bollinger, but with a softer edge. It has like an echo built into it, a flavor echo that rings on in your mouth for a while.